Local villagers from Maw Kee in Myawaddy District were frightened by gunshot fired Burma army commander near their village. 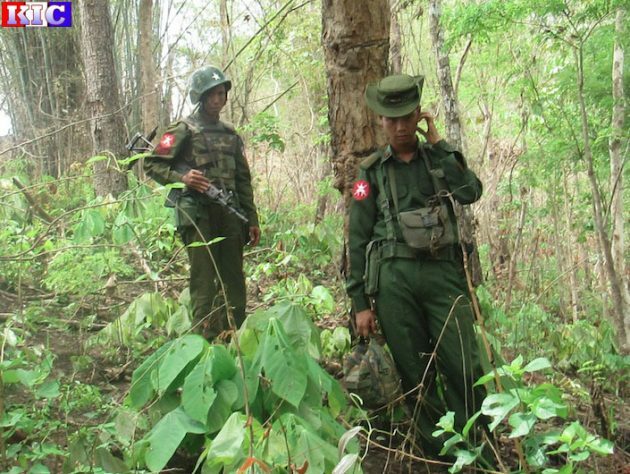 Villagers said the Burma Army was angry in negotiation with villagers when he demanded timber. Burma Army soldiers led by Major Nyunt Win Hlaing from Light Infantry Battalion #62 under Military Operation Command (MOC) #19 and based in Ka Nae Lay, Waw Lay and Mawkee villages were used to threaten villagers operating a sawmill. The villagers said the gunshots were fired when the officer demanded a ton of timber and the villagers refused. Villagers told Karen News that the sawmill operators had already given Major Nyunt Win Hlaing 10 tons of logs as he demanded and villagers said that they couldn’t afford his order for an additional ton. A villager from the area who asked not to be named told Karen News that the threats and gunshots took place on May 31st, 2016. Villagers said it was not the first time the same Burma Army soldiers had imposed on the Maw Kee villagers. Previously the villagers were forced to carry water for the battalion on three consecutive days. While the villagers were carrying water the soldiers fired many threating gunshots frightening the villagers. Lieutenant Colonel Saw Bu Paw, a deputy commander of the Karen National Liberation Army Battalion #201 confirmed to Karen News that the incidents with the Burma Army had taken place. According to the Nationwide Ceasefire Agreement, there are written rules on military ethics in Chapter 2, article D, to be observed when dealing with civilians. The NCA states that it is not allowed to make forced demands on the people for money, belongings, food or labour. KNLA’s sources said that LIB # 62 under MOC # 19 is based in the area has and as many as 30 soldiers including, Major Nyunt Win Hlaing, its the deputy commander, Tun Oo Lay, company commander, Phyo Win Lay, company commander, Captain Thant Zin Tun, Captain Aung Myint Tun and Captain Lu Min Myat. Before print Karen News tried to make contact with Burma Army officers for their comments on the incidents, but requests and phone calls were not answered.